1. Preheat the oven to 180°C (350°F) Gas 4. Sift the flour, baking powder (plus xanthan gum, if using) and bicarbonate of soda into a large mixing bowl. 2. In a separate bowl, whisk together the milk, yogurt, eggs, melted butter and tomato purée, then add this to the flour mixture. Whisk everything together well and season with salt and pepper. Mix the tomatoes and feta cheese into the mixture, along with the tomato oil and the chopped basil. 3. Divide the mixture between the muffin cases, making sure that some of the pieces of cheese and sundried tomato sit on the top of each muffin. 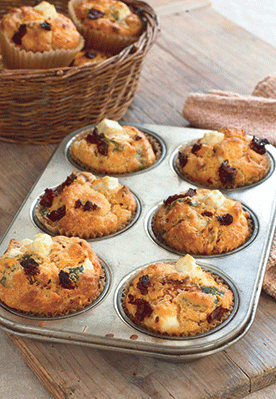 Bake the muffins in the preheated oven for 20–30 minutes until golden brown. Serve warm or cold. 4. The muffins will keep for up to 2 days in an airtight container, but can be frozen and then reheated to serve.